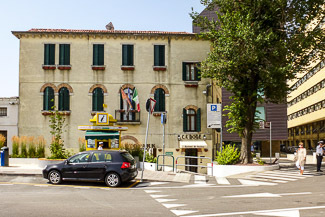 Venice's Ca' Doge is a B&B or inn at the southwestern corner of the Piazzale Roma, across from the People Mover station (which offers cheap, quick transportation to the Marittima cruise port and the Tronchetto parking island). Ca' Doge is accessible by car, and--almost unheard of in Venice--it has its own small parking lot. The location isn't beautiful or atmospheric (we'd rather be away from cars), but it's handy if you're traveling with a vehicle or you want quick access to the Marittima cruise terminals and the city's official baggage storage office. As you leave the airport bus or taxi, walk toward the large parking garage and the People Mover station behind the airport buses. Cross to the People Mover station via the red crosswalk. Take a free shuttle bus (if available), a taxi, or the People Mover elevated tramway (just outside the port entrance) to the Piazzale Roma. As you leave the station, turn right and walk past the large building to the Calatrava Bridge, a.k.a. the Ponte della Costituzione. Cross the bridge to the Piazzale Roma. Walk around the Piazzale Roma to the southwest corner, where you'll find Ca' Doge.